"Where is the great masterpiece? There is no masterpiece, no answer, it is all in the search." 'The miraculous draught of fishes' is considered by many to be Passmore's most ambitious painting. 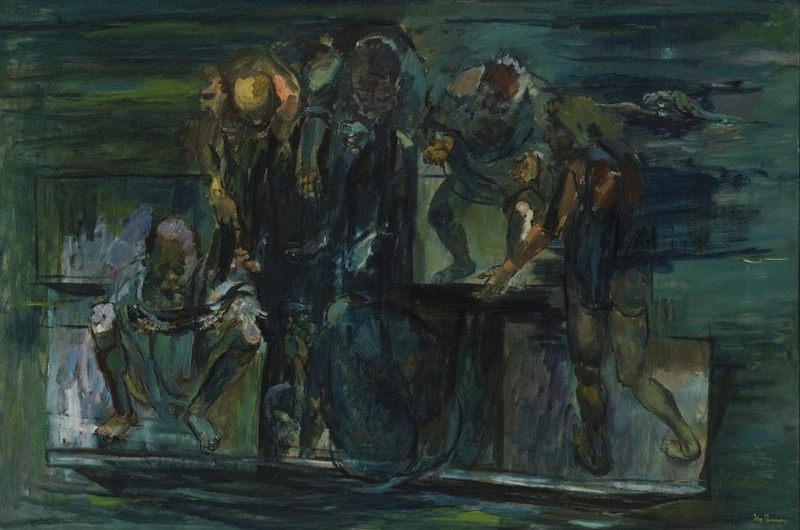 It was certainly one of the largest pieces he painted following his return to Australia in 1951 after a long period in England and he entered it in the Blake Prize in 1952. The painting had its genesis in a small pen and ink sketch. "Paintings like 'The miraculous draught of fishes' are heavily charged with emotions that have been heightened for transmission to us through the medium of line and colour. They are compositions of extraordinary vitality and originality, though the dazzle of their virtuosity never blinds one to the disturbing, though elusive, undercurrents just below the surface of the forms." Signed l.r. corner, yellow oil "John Passmore". Not dated.